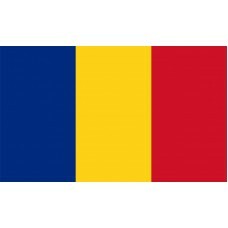 The Romania Flag consists of three vertical bands, in the colors of, blue, yellow, and red. The three colors of the flag represent the three provinces of the country, which are, Moldavia, Wallachia, and Transylvania. The red and blue color represents the province of Moldavia and the red and yellow color represent the province of Wallachia. 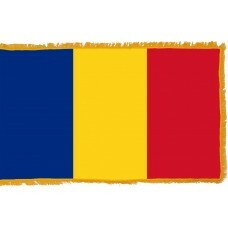 The Romania flag that is used today was officially adopted on December 27th, 1989. In 1878, a year after Romania gained independence, the national flag used was the same one that is used today, except that it had the country's coat of arms in the center of it. In 1989, the coat of arms was removed from the flag. Romania is a country in Europe that shares border with the Black Sea, Bulgaria, Ukraine, Serbia, Hungary, and Moldova. The capital city of Romania is Bucharest. The name Romania is derived from the Latin word, ‘Romanus’ which translates as "Citizen of Rome." The area that we now know as Romania was once colonized by the Romans. Some of the oldest human remains that have been found in Europe, were discovered in Romania. In 1859, the country of Romania was created when the provinces of Moldavia and Wallachia (formerly under the Ottoman Empire), united. Romania, however, was still a vassal of the Ottoman Empire until it gained full independence in 1877. In 1881, it became known as the Kingdom of Romania. At the end of WWI, Transylvania joined what is known as the Kingdom of Romania and Carol I became the first King of the country. Romania's economy is mainly reliant on manufacturing, electronic products, chemical goods, and pharmaceuticals. It is also one of the richest countries in Europe in terms of gold and is the only country in Europe that has a museum dedicated to gold. It is one of the least visited countries in Europe, despite the beautiful and historic sites that it is home to, such as "Peles Castle," which is considered to be one of the most beautiful castles in Europe and is also the first castle in Europe to be electrified. Romania is also home to the Carpathian Mountains, where one can find one of the largest virgin forests in the world, which houses over 400 mammal species. The city of Brasov is home to the "Black Church" which is one of the finest examples of Gothic architecture and home to the largest organ in Europe and the heaviest bell in Romania. Another main tourist attraction is "The Transfagarasan" which is a famous road with the longest road tunnel. The road is at the highest altitude (2,045m) and is referred to as the "road of clouds" as it is claimed that once you are there you "feel like you are walking on air." The "Bigar Cascade Falls" which is one of the top attractions that Romania has, were voted as the most beautiful waterfalls in Europe due to the way that they fall. Stronger than your foes', Fate for them to bow to. Triumphant in battle, the Name of Trajan. Old men, and young, from mountains high and open plains. "Life in Liberty or Death", all shout together. Swear allegiance, to be forever Brothers. In times of such great danger, proves to be a traitor. Will ask us to pass through sword and flame. Whose fatal wounds we feel burning today? Which for centuries enslaved us, as cattle? Through intrigue and coercion, malicious plots. Than be enslaved again in our ancestral homeland.